When a process server is given a job by a client, they are provided with basic information in order to get the job done, which typically includes a name, address, deadline, and sometimes even a physical description or best time to serve documents. In some cases, process servers will serve unnamed individuals of a specific address to ensure that anyone and everyone residing at that location is properly notified of impending legal actions (this commonly happens in eviction cases). Getting this routine information is pretty standard among process servers across the U.S., no matter what types of cases they typically handle. But what happens when you get an a-typical case where you don’t have much to go on? How do you go about serving an individual for whom you don’t have an address, let alone a name? Michele Dawn and her team at Rancho Attorney Services were tasked with doing just that. Her client had brought to her a case in which an elderly individual had bought a large parcel of land (33 acres) in Northern California approximately 30 years ago, paid taxes on it, but left the property vacant. Squatters arrived on the vacant property, creating trash and unsightly conditions, which prompted city officials to issue several citations. In accordance with California law, the owner was required to serve a Notice to Quit on each of the inhabitants. It wasn’t just a couple of people squatting – an impromptu village had sprung up on the land, complete with a makeshift jail. In order to abide by the law, the property owner’s attorney contacted Michele to serve the unknown occupants with the notice to vacate the property. She turned to a Facebook group for process servers to get some advice. Most of the process servers who responded in the group were baffled and suggested she defer the job to another process server. Still, others thought it might be a job for the sheriff. I called Michele to learn more about this job in hopes that we could uncover some tips that could help out other process servers. Through our conversation, I was able to glean a clear picture of the steps she took, which would be undoubtedly helpful to others tasked with completing a service with little to no background information. 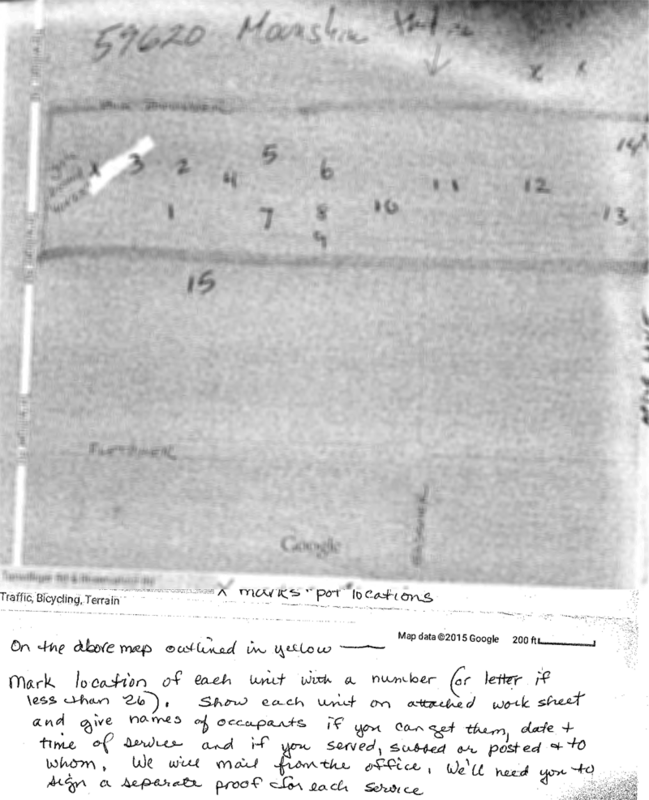 Map Text: On the above map outlined in yellow – Mark location of each unit with a number (or letter if less than 26). Show each unit on attached worksheet and give names of occupants if you served, subbed or posted & to whom. We will mail from the office. We’ll need you to sign a separate proof for each service. After reviewing the maps of the area, Michele and her team were able to pinpoint the closest streets that neighbored the encampment. The process server took a few hours and physically looked for the land. The streets that appeared to border the parcel either had been re-named or didn’t exist, and the server had to hike the property in order to locate the squatters’ encampment. 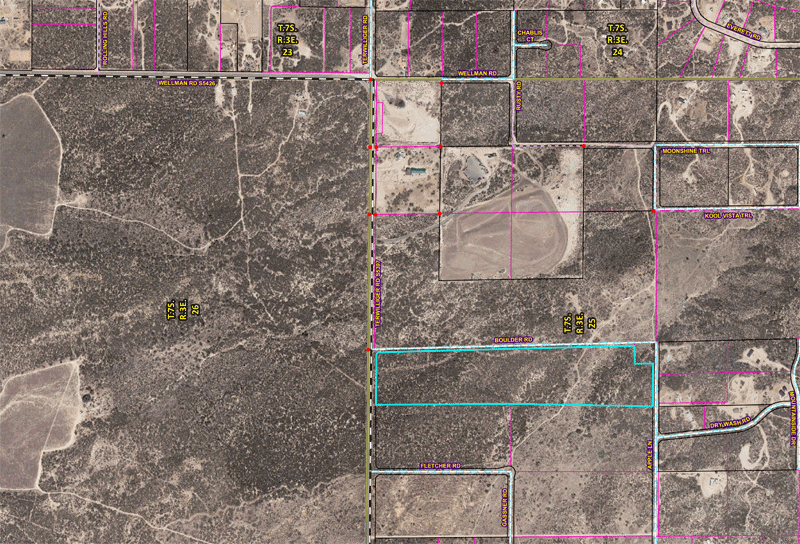 From there, the process server assessed and documented how many units were on the parcel of land, where they were located, and potentially how many inhabitants were there. The service became further complicated with the fact that it wasn’t just a couple of people squatting— an impromptu village had sprung up on the land, complete with a makeshift jail. And it appeared as though that “village” was completely off the grid. Once actually on the land, the process server noticed that they had power supplied by the electric company, which was run from the main road. This turned out to be hugely important as it enabled Michele and her team to do some research and determine what address the squatters were using for the power. The server then obtained names of several of the squatters and completed personal service on those individuals. Additionally, he was able to gain the names of other squatters who weren’t present at the time he was completing the personal service. For the squatters who weren’t present, the server subserved the squatters who were present with documents for those who weren’t. Since he was also serving “All unknown occupants,” he posted another copy of the documents on each unit. A second copy was also mailed to each of the “All Unknown Occupants” at the address that was reportedly used by the electric company. At the time of publication, only the mailings to “All Unknown Occupants” had been returned. As third-party messengers, process servers deliver a variety of documents encompassing everything from divorce papers to foreclosure notice, and sometimes there isn’t that much to go on. Our post offers you some solid tips on approaching these difficult serves so that you can do your job more efficiently and with less hassle. Here are our 7 tips for tackling this tough serve. It might seem obvious, but it’s important to take notice of the information that you don’t have. By being aware of what don’t know, you will have a better idea of where to begin and where to start looking. If you aren’t given names, find out if you need to have them or if the documents can be addressed to unnamed occupants. Once you know what you’re working with, you can begin to explore what options you have to obtain that information. But more on that in just a minute — it’s important to also assess what information you do have available before you jump into a search. It will help you save time from researching information you might have already been given. 2. Gather Knowledge — What Do You Know? After you have evaluated the job and figured out how you’re going to approach it, determine what information you have or are able to obtain, even if it is precious little, and figure out what public resources you can use to secure additional information. Google maps, local government, and public records are excellent ways to begin your search. What you know might grow after a quick, easy search. In some situations, you are given at least one piece to the puzzle. If you have a name, you can easily consult a skip tracer if that is not a service your company offers. Skip tracers can access privileged information and complete the legwork in attempts to find a best known address for an individual. They access records, complete surveillance (if needed), and conduct background checks. In some cases, you might have to do some investigative work, potentially even surveillance, to find the individual(s) and get them served. Keep in mind that you may need to consult a private investigator to complete some of this detective-work if you are not licensed yourself (if you’re interested in going that route, head on over to PInow and learn How to Become a Private Investigator). Also be sure to consider your state’s laws on private investigation and what being a PI in your state entails. Even if you are simply gathering information and providing a report on individuals, you may be unknowingly doing PI work, so be sure to check your state’s PI laws and maintain proper licensure. No one knows the lay of the land like a local does — you live it, you breathe it, and you know it like the back of your hand. If you’re new to the area, or you have not previously invested the time getting to know the area, start learning. Especially in cases like these, having first-hand knowledge of the area and landmarks may help you in a way that records or evidence can’t. Attempting to complete a difficult service out of state may be asking for unnecessary headaches. For jobs like these, it’s best to stay local or at least with a company that has local resources. Similarly, by working in your own community (or at least knowing it well), you’ll set yourself up to complete service more expeditiously by not needing to spend time conducting geographical research. Sometimes you just have to hit the ground running and start knocking on doors. Talk to neighbors, physically drive around, and look for the property. Again, this may be a situation where you need a PI license, but if you have one, it’s time to get out and get to work. Pound the pavement, or the dirt road as it may be. Prior to accepting a job of this magnitude, know your abilities and limitations. For example, if your client sends a difficult job through as a rush, evaluate your capabilities, the time it could take, and your resources. By having the foresight to see the difficulties you and your team might face in getting the job done, you’ll keep your client happy by letting them know what’s possible and what’s not — you would also give your client the opportunity to ask for an extension before it’s too late. Obtaining records, conducting skip traces, doing research and physically looking for the property/individual can take a lot of work hours. Don’t sell yourself short in terms of costs — make sure you have a fair agreement with your client before getting started. If not, you may end up regretting it later. If you are given a job that may require a considerable amount of investigative time and research, in addition to actually serving the documents, work with your client to see if it’s possible to leave your billing options open. Many process servers require a deposit or longstanding relationship before they would take work without payment in full or a deposit. For these troublesome cases, and especially if it’s a new client, do your best to get a deposit prior to beginning work. The old adage “you get more bees with honey” is true. Although your client is paying you, as a process server you’re there for the individual receiving the papers as much as the person who hired you. Even the most simple jobs can become incredibly challenging when you’re missing information. Facing a challenging job can be overwhelming, so utilize these tips to break it down and fully evaluate how much time and resources you may need to invest into the job. Once you break everything down and establish a plan of action, it should be a little bit easier to determine how to go about tackling one of these kinds of serves so that you can get the job done. We know Michele Dawn’s story isn’t the only one out there, and we want to hear from you. What challenges have you faced when given a job without addresses or names? How did you tackle them?